LEGO DUPLO Cinderella’s Carriage. Encourages role play skills. 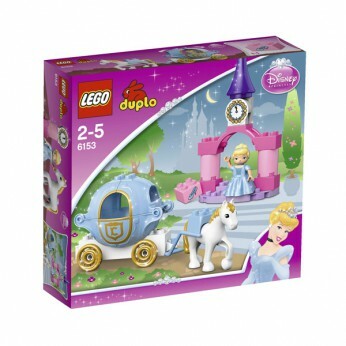 Includes Cinderella DUPLO figure, gold decorated pumpkin carriage with DUPLO horse. Castle portal with tower and clock. For 2 years and over…. Cinderella is riding in the pumpkin carriage to the castle ball. She’ll surely be the talk of the ball with her beautiful dress and pretty glass slippers. Includes Cinderella LEGO DUPLO figure. LEGO model number: 6153: Size H26.2, W28.2, D7.6cm; Weight 444g; For ages 2 years and over; EAN: 5702014832817 . * 7282773 18.49. Cinderella is riding in the pumpkin carriage to the castle ball. She’ll surely be the talk of the ball with her beautiful dress and pretty glass slippers. Includes Cinderella LEGO DUPLO figure. This toy costs approximately £19.99 (for the latest and best prices make sure you check our retailer list for the LEGO Disney Princess Cinderella’s Carriage 6153 above). In our review of LEGO Disney Princess Cinderella’s Carriage 6153 we classed it as being suitable for ages 6 years, 7 years, 8 years, 9 years, over 10 years but recommend you check the manufacturer specific advice before purchasing.